Please note that I am not a doctor. This is a personal opinion piece and should not be considered medical advice. Please consult a doctor or naturopath regarding your family's personal vaccination and health care plans. Whether your family does flu shots or not, you'll want to adopt some extra practices during cold and flu season to keep your family in tip top shape. 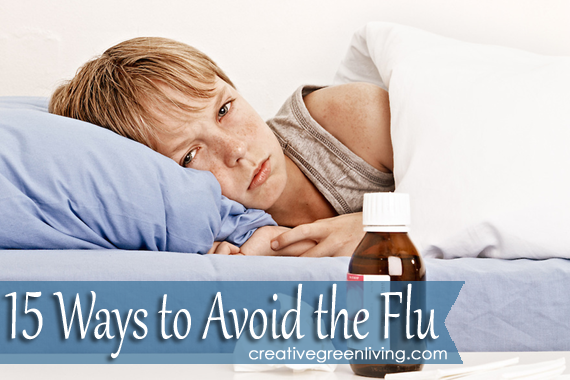 Here are 15 ways to keep your family healthy and flu-free this winter. 1) Wash your hands before eating. I admittedly am horrible at this normally. It's easy to just pull up a chair at the table to eat. But take a couple minutes to wash your hands first -especially during flu season. 2) Wash your hands before and after you use the restroom. Starting with clean hands before you touch delicate areas can help prevent you from introducing germs to an area where you are susceptible. 3) Use a paper towel to turn off the faucet. It might feel wasteful to let the water run a bit longer while you get a paper towel but it will go a long way to prevent re-contaminating your freshly washed hands in public washrooms. If you're in a paperless bathroom, use your elbow to turn off the water instead. 4) Open restroom doors with paper towels. Again, you don't want to contaminate your freshly washed hands with bathroom germs. If you're in a paperless bathroom, grab some extra toilet paper or keep a travel pack of tissues in your purse for this reason. 5) Sanitize frequently. I'm not normally a huge fan of hand sanitizers but I keep a bottle in my car and one in my purse specifically for use during flu season. Be sure to avoid sanitizers with the toxic ingredient triclosan. My favorite is this Aloe & Witch Hazel Hand Sanitizer from Burt's Bees. 6) Use cart wipes. Use cart wipes to clean shopping carts or shopping basket handles before use. Most stores provide these but I keep some extra Seventh Generation Disinfecting Multi-Surface Wipes in a baggie in my purse as back up. 7) Do a daily wipe down. Once a day, take a minute to cruise through your house and wipe down the door knobs and faucet handles. These are high contact areas where germs will build up. Wipe them down every day to mitigate the germs being shared with your family. Check out some great cleaning supply recipes here. 8) Boost your immune system with probiotics. The more we learn about the immune system, the more science is saying that a lot of our immunity is based in our gut. Probiotics from yogurt, kefir or a supplement (we like American Health Acidophilus and Bifidus Chewable Tablets , which come in several flavors, are lactose free and taste good) will help enhance your natural immunity by boosting the population of beneficial bacteria in your gut. When shopping for supplements, be sure to find one that measures the quantity of bacteria in the billions. 9) Boost your immune system with vitamins. Ideally you would get all the nutrition you need from the food you eat. The sad truth is that most Americans just aren't able to do that because our food is so nutrition poor. I personally prefer vitamin gummies like Nutrition Now Gummy Vitamins because they are more pleasant to take than swallowing pills. Nutrition now makes several formulations including one for kids, women and more. My son takes their kids line of vitamins and I take their women's multivitamin. Pay particular attention to how much Vitamin D and C are in the vitamins you shop for. 10) Prevent the flu with elderberry syrup. Elderberry syrup is a natural preventative and protects cells from being able to be infected with viruses. Make your own (it's really easy!) or buy it on amazon. 11) Get enough rest. When we don't get enough rest, our systems start to stress out. When our systems stress out they are not as efficient at fighting off the the daily germs we come in contact with. I know this can be easier said than done for most moms, but if possible try to take advantage our our increased number of dark hours and turn in early. 13) Stay hydrated. If plain water isn't for you, try hot tea or iced tea (make your own!). Despite Coca Cola's campaign to tell you otherwise, soda and coffee do not count. These beverages tax your system instead of supporting it. Stick to water and tea-based beverages. 14) Stay home. If there is a particularly bad outbreak in your area, stay home except for essential trips. Avoidance of sick people goes a long way to keeping you healthy. 15) Wash hands as soon as you come home. If you're been out and about be sure to wash your hands once you come home to avoid contaminating your personal space with germs you picked up on your hands while out in public.